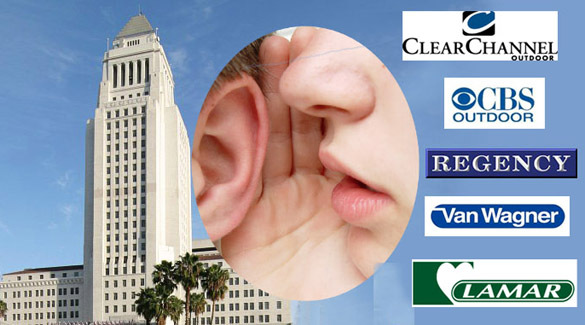 For the second year in a row, lobbying expenditures by L.A.’s five major billboard companies approached $1 million, according to filings with the City Ethics Commission. Those companies also made $8,500 in direct campaign contributions to incumbent City Council members and another elected official. Clear Channel led the money parade, paying $424,443 to registered lobbying firms. Far behind in second and third, respectively, were Regency Outdoor, $155,157, and Van Wagner Communications, $150,728, followed by CBS Outdoor, $146,371, and Lamar Advertising, $60,000. Three of those companies—Clear Channel, Lamar, and Van Wagner—contributed a total of $6,000 to ten city council members. In addition, Van Wagner contributed $1,500 and Clear Channel $1,000 to City Attorney Carmen Trutanich. The city council members getting billboard company contributions were council president Eric Garcetti and members Jose Huizar, Greig Smith, Paul Krekorian, Tony Cardenas, Richard Alarcon, Jan Perry, Janice Hahn, Bernard Parks, and Ed Reyes. Note: In a 2008 radio interview, Garcetti said he had never “willingly” accepted campaign contributions from billboard companies. See: Is Eric Garcetti Trying to Rewrite History? City ordinance limits direct contributions such as these to $500 for council members and $1,000 to citywide officeholders, such as the city attorney, who has been deeply involved in litigation in both state and federal court involving unpermitted billboards and supergraphic signs. So what did these outdoor advertising giants expect to get in return for money spent on lobbying? Unlike 2009, when a new city sign ordinance and a ban on new billboards were up for debate by the City Planning Commission and the City Council, 2010 was relatively quiet, with the only measure directly affecting billboard companies’ bottom lines a proposed billboard excise tax. However, a move to put that tax to a popular vote in the upcoming municipal election died in committee meetings that were heavily attended by lobbyists. Other matters that could have indirectly affected companies like CBS Outdoor and Van Wagner, which own and install supergraphic signs in addition to billboards, were the successfully-adopted ban on new supergraphic signs in the Hollywood sign district, and the proposed Wilshire Grand sign district downtown. In addition to lobbying the city, Clear Channel and CBS Outdoor are pursuing court action against the city to overturn an area planning commission decision that permits for two of the companies’ digital billboards should not have been issued. Regency also has a long-running lawsuit against the city in federal court, seeking millions in damages for the denial of new billboard permits more than a decade ago. Clear Channel, CBS Outdoor, and Lamar Advertising are the three largest billboard companies operating in L.A. and the U.S., and all earn well in excess of $1 billion per year. Regency and Van Wagner are privately-held companies and aren’t required to disclose their income. West Hollywood-based Regency is the only one of the companies from the L.A. Area. Clear Channel is headquartered in Texas, CBS Outdoor in Arizona, Lamar in Louisiana, and Van Wagner in New York.